Razer Announces Pro|Click Mobile Launch Date | OhGizmo! By Shane_McGlaun on 09/14/07 • Leave a comment! We previously wrote a bit about the Razer Pro|Click Mobile mouse. Razer announced today that the mouse would be available for purchase starting in October for $49.99. The mouse will come in red, pink, white, and black. Razer calls the Pro|Click Mobile mouse the most accurate portable mouse and with 1200 dpi resolution, they are right. The mouse connects to your notebook via Bluetooth 2.0 with adaptive frequency hopping and uses an ambidextrous design. Power comes from a pair of AA batteries and a travel pouch is included. There is no mention anywhere of the mouse including a USB Bluetooth adapter. If your computer has Bluetooth built-in, you wouldn’t need an adapter though. 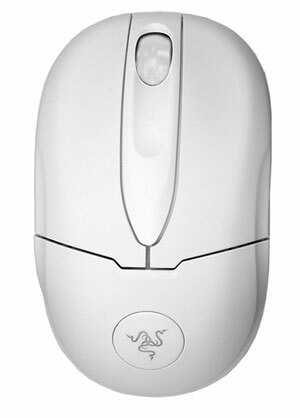 The white mouse is suitably Mac and will work with OS X 10.3.9 or later as well as Windows.